We've traveled to both ends of the Basque country of Spain --Barcelona to the east and San Sebastian to the west--to sample the delicious and varied bar snacks or finger foods known either as tapas or pintxos. On a trip to Barcelona some years ago, and again recently to San Sebastian, we were served the most astonishing dish called simply Pimientos de Padrón--Peppers of Padrón. These are small, pointed green peppers related to Capsicum annuum (ornamental red pepper) with long stems that are sautéed in olive oil ‘til they blacken a bit and wilt, drained, sprinkled with sea salt and served hot. They are sweet (most of the time) and amazingly flavorful, a bit nutty, with just a hint of the flavor of okra (possibly as they're eaten seeds and all). There is an element of culinary Russian Roulette, as an occasional pepper (or sometimes more) will be very hot. A year ago I was nosing through the bins of the Tierra Vegetables farmstand on Airport Boulevard just east of 101 in Santa Rosa when I came across a box of these exotic peppers. They were a good bit larger than the ones served in Spain, and one of the farmers stated his belief that the larger ones can be hotter. I bought a couple pounds anyway, and took them home to try my hand. They came out of the sauté pan looking exactly as they ought to, but--wow--most of them, not a few, were quite hot--had the right flavor, but way too much capsaicin (the substance in peppers that makes them hot). Just a month ago at the SR Saturday Farmer's market, I came across a small basket of Padrones at the Crescent Moon Farm stand. Quite small, I bought what was left--about a half pound. David Moring, Crescent Moon's co-owner stated that his Padrones are almost all taken by restaurants or reserved in advance by aficionados. He also said that in his experience about one in twenty is spicy. These tiny examples were perfect. Warm from the frying pan, sweet, salty, with that faint okra tang--so delicious. At a recent Friday Sonoma farmer's market, I spoke with David, one of the farmers responsible for peppers at Oak Hill Farms. Their Padrones were larger that day, and I asked if they intended to harvest any smaller. He said that these had gotten away from them a bit, and they intended to get the size back down, but interestingly disputed the idea that larger size correlates to higher heat, continuing "I had a tiny one the other night that was the hottest I'd ever had--blew my head off". Last week the Orchard Farms stand at the Saturday Santa Rosa market had a huge basket of them--all perfectly tiny. Once again the result of a quick pan-fry was sublime: close your eyes, take a sip of dry sherry, pop those babies into your mouth, and instant transport to the pintxos bars of Basque Spain. The history of the Pimientos de Padrón was described by Calvin Trillin in the November 1999 issue of Gourmet Magazine. According to Mr. Trillin, Franciscan monks at the monastery in Herbón in Spain's northern Galicia province first tried growing the pepper seeds they’d brought back from the New World in the 18th century. This place still remains the heart of the Pimientos belt today. ”Nowadays there is a Padrón Festival in the town of that name every August and Pimientos de Padrón are becoming one of the most popular tapas all through Spain." For the parts of the county where peppers grow well, these could become a hit. I haven't experience growing them yet, but will certainly try next year. David at Oak Hill says they plant seeds in the greenhouse at the January full moon (or February if the January moon is late)--he says they propagate as easily as most peppers. Like most peppers here in Sonoma County, young plants are transplanted into the field mid-May. They are placed 12-18" apart in double rows about a foot apart. They mature (green state only) and are ready to pick from mid-July. Seeds may not be commercially available locally. The distributor for Franchi Sementi Italian seeds website shows availability, and Localharvest lists them in their seed catalog, but currently shows as out of stock. There are reports of Padrón seeds being sold on E-Bay. In any event, a batch from the farmer's market should yield plenty of seeds for a crop next year if you're inclined to try growing them. Clean and dry the peppers. Heat a skillet with 1/4" of olive oil in it until very hot but not smoking. Dump the peppers carefully into the hot oil--they will sizzle and pop--a splash guard helps. Turn frequently with tongs until blistered, wilted and partially blackened. Drain in a strainer, spread on layers of paper towels and pat to absorb some oil. Transfer to a hot plate, sprinkle liberally with sea salt, and commence eating--mind the roulette. Corno de Toros are a beautiful, long, dark-red heirloom Italian pepper. 6-10 inches long, twisted or curved and pointed on the end. These deep crimson beauties are very sweet and intensely 'peppery'. 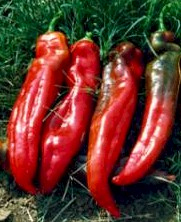 They're a perfect roasting pepper-their skins blacken nicely, and shed easily--and are also good raw in salads. In my opinion the flavor of Corno de Toros is superior to that of red bell peppers. They are relatively easy to grow, as long as they receive plenty of moisture and nutrients, are not subjected to cold and receive plenty of sunshine. Seeds should be started indoors 8 to 10 weeks before the last frost. Peppers are often the last veggies waiting to go into the garden. Soil temperature has to be quite warm, or they will just sit in the dirt and cry, waiting for the hot summer weather. When the temperature reaches 70 F, transplant 12 to 18 inches apart, fertilize, again when they are 12 inches tall and occasionally thereafter, depending on vigor. Plants should be staked or caged to avoid collapsing. These are 75-85 day plants, and normally will fully ripen starting in early August. Corno de Toro seeds are available from Renee's Garden, as well as the above referenced Grow Italian website. I roast them over an electric grill (I find that gas flame roasting makes them much harder to peel). When blackened, they go into a paper bag for 15 minutes to steam and cool. The peels will then slip off easily. Remove the stem end and seed pods, slit the peppers open, and scrape away the remaining seeds. Slice the peppers into strips, toss in a bowl with a bit of salt, extra virgin olive oil and a splash of good balsamic. Use them anywhere you would roasted red bell peppers. Or leave them whole after peeling, and stuff with creamy goat cheese and serve cold drizzled with oil and vinegar. Or stuff them whole after peeling with a mixture of cooked rice, crumbled Italian sausage, whatever veggies from the garden you have extra of--(zucchini, or course, fennel, tomato, whatever--finely diced, and warm in the oven drizzled with good oil. Surely you can think of a dozen more ways. Peppers are rich is goodness--one medium-sized pepper will provide almost the entire daily adult of vitamin C requirement and also contains vitamins such as B1, B2 and D, plus numerous minerals. So go and compose a pepper meal. Padrones for appetizers, those Cornos with goat cheese on some chopped radicchio as a salad, and perhaps Poblanos stuffed with some variation of that rice-sausage mixture for a main course. But . . . . .pepper ice cream? Maybe leave that for the Iron Chefs.